This post is about the drone laws in South Korea. 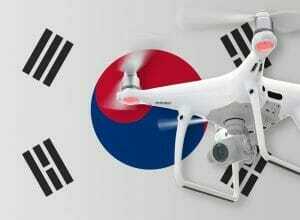 The South Korean government is reasonably open to drone technology. Nevertheless, there are some rules to consider. Maximum altitude: The maximum height for drones is 150 meters above ground. Maximum horizontal distance and FPV: In Korea, you need to be able to see your drone and its attitude always with the naked eye. Compulsory insurance: If you have to register your drone in South Korea, then you need drone insurance with a minimum cover of KRW 150,000,000. Distance to airports: At airports, a distance of 9 kilometers must be taken into account. Other safety distances: No drone may be flown over crowds. No-flight zones: In Seoul, there is a ban on drones. However, there are specially designed parks for copter pilots. No-fly zones can be checked using the “Ready to Fly” app. Hours of Operation: After sunset and before sunrise, drone flights are not allowed in Korea. Requirements for commercial pilots: If you want to fly a commercial drone in South Korea, you need to register with the Minister of Land, Infrastructure, and Transport. As far as I understand, the obligation to register exists only for commissioned work. If you make recordings for your own company, then you probably do not need registration. We have researched the listed drone regulations for South Korea to the best of our knowledge. We cannot guarantee the correctness of the information. If you want to be on the safe side, contact the competent aviation authority. Alternatively, you can also ask the embassy in your country for further information about the regulations. Please leave us a comment when you receive news and/or gain experience with your copter in South Korea! Seoul is basically a no-fly zone. Between, Gimpo airport, the Blue House, the military base, and embassies, the whole city is restricted. Thanks for sharing this article on drone rules in South Korea! I have a job coming up there soon and was looking around for more information. From where I come from (Singapore) the rules are very strict as well and without a permit we cannot fly above 200 feet to take any aerial photos or videos. Can you fly drone on nami island where the trees are located?